It’s a pretty captivating pitch: Andy Rubin, one of the guys who founded Android (and who lead the project within Google for eight years!) has a new company… and he’s building an Android phone. 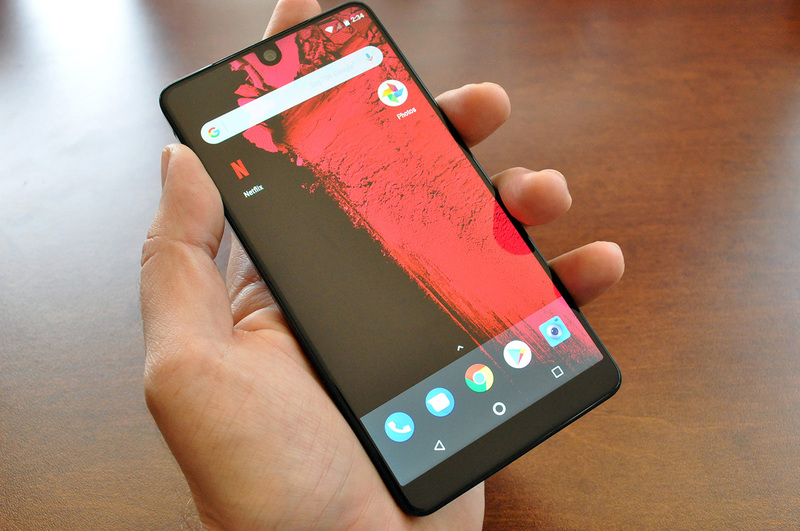 The “Essential Phone,” as it’s known. I’ve been carrying around an Essential Phone for a few days now. Here’s what I think so far. In a world with a million different Android phones, what makes this one stand out? The aforementioned ties to an Android co-founder might hook some die-hards… but what about everyone else? What’s this phone’s thing? A body built of titanium and ceramic, coming together into what is probably the shiniest (for better or worse — more on that later) smartphone I’ve ever seen. It’s truly a beautiful phone. A striking display with a mega-thin bezel; it stretches nearly all the way to the top of the device’s body, with a small cutout reserved for the front-facing camera and a more standard bezel across the bottom. A pair of data/power pins on the rear of the device that allow you to snap on optional magnetic accessories to expand the phone’s capabilities down the road. 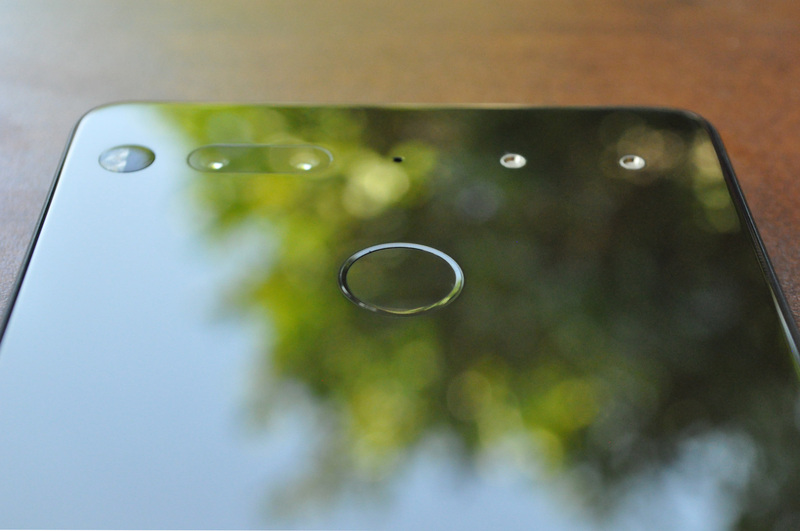 If you were to walk up to an Essential Phone sitting on a table, the first thing you’d probably notice might actually be the lack of things you’re meant to notice. There is no branding, be it Essential’s logo or a carrier’s. There is no camera bump. Beyond the cutouts for things like the dual cameras, the flash and a fingerprint reader, it’s a sprawling, gleaming slab of shiny. And oh how shiny it is. The model I’ve been carrying around is a color the company calls “Black Moon” — the color it’ll ship to buyers first. Imagine a mirror finish with a limo tint; fully polished, fresh out of the box, it’s pretty damned stunning. Alas, a shine like that comes with an inherent catch: This thing picks up fingerprints like that is its job. If fingerprints drive you up the wall, you might want to wait until matte colors are available or get used to wiping this thing down every five seconds. But what about marks more permanent than a fingerprint? I’ve been toting this phone around with all sorts of other stuff crammed in the same pocket. Keys. Coins. Other phones. Two days in and — honestly, a bit to my surprise — both the display and the back of the phone are flawless. We’ll see if it holds up in the coming weeks. It feels good in the hand, its titanium body feeling remarkably sturdy. At around 180 grams, it’s a touch heavier than either the iPhone 7 (138g) or the Pixel (143g)/Pixel XL (168g), but never so much that it bothered me. The battery life seems great so far. Two days is a short sample, but I found myself pleasantly surprised by how much battery was still left on the device on multiple occasions. That’s a good sign. And, because I just can’t not mention it: this phone has no 3.5mm jack. I don’t like that. I don’t like it on the iPhone, I don’t like it on the rumored Pixel 2 and I don’t like it here. I have half a dozen Bluetooth headsets around my house, and I still mourn the death of 3.5mm. It comes with an adapter, but I’ve been anti-adapter for nearly a decade now. Now, about that screen. That crazy bezel-light screen, and that front-facing camera poking out right into the middle of it. When the first photos of this thing trickled out, I thought I’d find the camera cutout a good bit more distracting than I do in practice. I’ve already stopped noticing it. Android mostly uses that top-most section of the screen for its notifications bar, and doesn’t really use that center bit much — so rarely do I find myself thinking about what should be there. 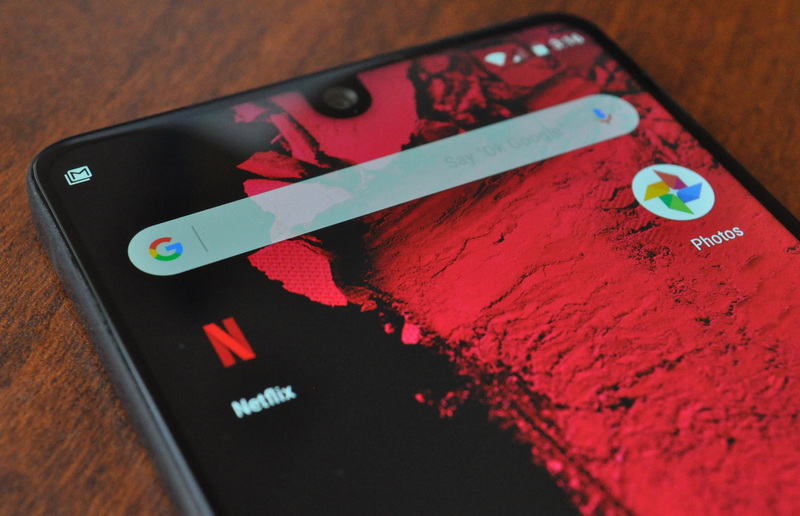 When apps — take, say, Netflix — go fullscreen, the regions next to the camera go dark, effectively shrinking the size of the display to what it’d look like with a more standard top bezel. While it’s better than having a camera sticking a quarter of an inch into your video, it’s a bit jarring to have your screen suddenly lose a chunk you’ve grown accustomed to seeing lit up. Would it be better without that cutout? Sure! But with display bezels shrinking and selfie-taking at an all-time high, the front-facing camera will forever need a home. Add in the fact that it looks like the next iPhone might take a similar approach, and I’d expect these lil’ front-facing camera peninsulas to become pretty standard. We’ll save the deeper camera comparison stuff for the full review, but the Essential Phone’s rear camera seems strong — particularly outdoors. Indoors and in low-light situations, my results have been more mixed. To slim things down and ditch the camera bump, they’re actually spreading photo duties across two cameras here: one color, one monochrome. The monochrome sensor is able to pick up a bit more detail than its color-sensing counterpart, so they take an image from each and merge them together through a bit of post-processing magic. The dual cameras also allow for a portrait mode (read: pretty blurred backgrounds while your foreground subject is in focus); the company showed us a preview build of it, but it wasn’t quite ready in time for the review units. Arguably the most intriguing aspect of the Essential Phone are those two little pins on the back. 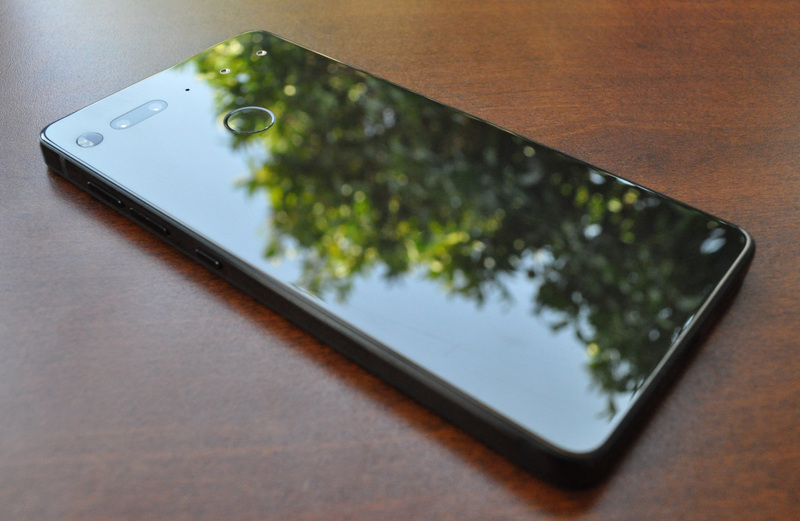 In theory, those pins let the Essential Phone do all sorts of fun things moving forward. They carry power and data between the phone and optional magnetic accessories that you can buy moving forward. Those accessories should be compatible with other devices the company releases down the road, including their Amazon Echo/Google Home competitor, the Essential Home. I say “in theory” because… well, they haven’t done the best job of saying what those fun things might be. They’ve announced a 360º camera, a dock and… that’s it, so far. They’re promising new accessories “every few months,” but aren’t saying much concrete about what they’ll be. It’s a similar promise to the one Motorola made with the Moto Z last year and, more recently, the Moto Z2. Even now, Moto’s platform lacks any real earth-shattering, must-have accessories that really prove the concept. 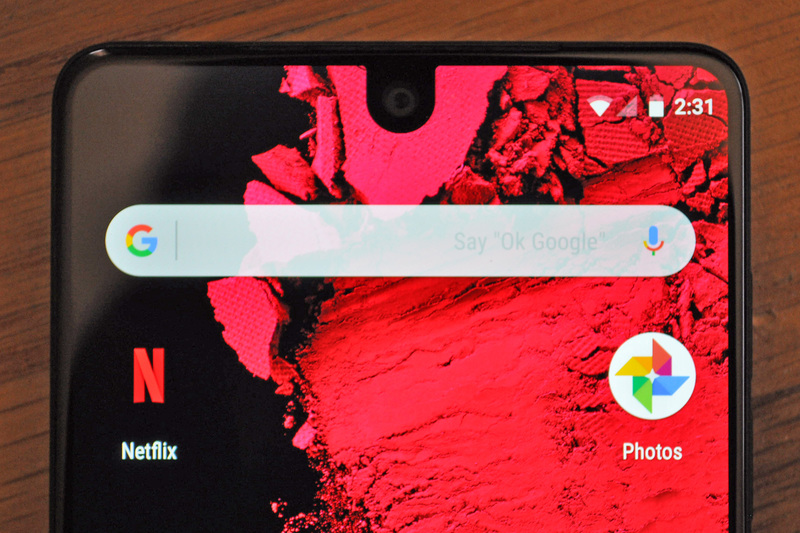 Could Essential have some ultimate accessory up its sleeve? Maybe. But until they show it, anyone buying the phone for those pins is buying on the intangible promise of something. “Imagine the possibilities!” is an easy well to fall into — but, if those pins are the main draw for you, I’d wait until there’s at least an accessory or two that really make sense for your needs. Alas, no accessories — including the 360º camera — were ready for reviewers just yet, so there’s not much I can say on that front. I did get to check out a prototype model of the 360º camera, which already felt quite easy to magnetically snap in place and sturdy once it was there — but beyond that, we’re still waiting on the production units before we really dive deep here. The device runs what is effectively pure Android (Nougat, 7.1.1), tweaked only to account for things like the camera cutout. I saw a glitch or two along the way — it took a few resets before my SIM would activate, the notifications bar seemed to crash twice, the camera app felt a bit shaky at times… but things like that are all part of the deal with a brand new phone from a brand new team, and I’ve already seen them issue patches. On the software front, this team seems to move fast.